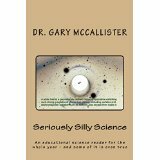 Two chapter from my book "Seriously Silly Science"
SERIOUSLY SILLY SCIENCE: a science reader for the year - and some of it is even true, is now available in paperback and kindle editions at Amazon. This is a collection of essays on scientific topics organized according to the months of the year, one chapter for each week. Below are two sample chapters, and one of them is not even in the book. This is in keeping with my general policy to under promising and over delivering. I can promise you nothing from this book, but you will get sixty chapters instead of what would be a normal 52 chapters in an annual reader. Quick! I’m in a hurry! What’s the most commonly-consumed, mind-altering substance in the world? Nope. Nope. Nope. It’s caffeine. Perhaps you hadn’t thought of caffeine as a mind-altering substance. But, of course, it is. Why else would someone consume a normally very bitter-tasting compound, if there was not some desired result? But we’ll get to that. Unlike other drugs, which are scarce in the natural world and have to be laboriously and delicately extracted or created, caffeine literally grows on trees and bushes, some kinds of cacti, lily, holly and camellia. In fact, I found that there were more than one hundred species of plants that produce caffeine molecules in their seeds, leaves, or bark. Hurry! Can you tell me how many species of plants manufacture nicotine or morphine? Just one each! Quite a contrast. I wonder what caffeine is for in the real world. Maybe it’s just so bitter it keeps consumers away. Either that, or it makes consumers so hyper they become inefficient. I’m just saying. Human association with caffeine began a very long time ago. Different plants containing caffeine were discovered in different geographic regions of the world, but the use of all of them by humans was wide spread. Today, tea and coffee are the most popular drinks in the world. More tea is consumed, but coffee is a close second. However, in the US, soft drinks may surpass coffee in consumption. The “cola” in some soft drink names comes from the “kola” bean, found in Africa, which is used for caffeine extraction. Caffeine is manufactured by plants from a precursor molecule called xanthine. This chemical is widely distributed throughout nature. In animals it is used to manufacture DNA, and any excess is converted into uric acid and is excreted. But in plants, xanthine acts a little like a convenient table on which to stack other things. One of the things plants stack on the xanthine table is a molecule called a methyl group. These additions make caffeine kind of a lumpy, funny-shaped molecule. This is important because the molecule must attach itself to another molecule in the cell membrane in order to alter cell function. The two have to fit together like a lock and key. This peculiar shape, then, makes caffeine highly selective and specific as to which cells in the human body are affected. It has very little effect on most cells of the body. But to the cells that have the matching molecule, it binds very tightly. Excessive, but normal, neuronal stimulation while awake produces yet another molecule called adenosine. This binds to other neurons and slows neuronal firing to keep neuron activity within safe limits. Caffeine mimics adenosine. When caffeine slips into adenosine’s place, it acts like a piece of wood under your brake pedal in that you can’t slow down the neuron activity. It doesn’t stimulate at all. It just blocks the brake. Your own natural neurotransmitters do the stimulating, and driving without brakes does have its hazards. The group of cells that are most sensitive to the adenosine brake are found in a small area of the brainstem. But those cells fan out and connect to every other portion of the brain. That is why caffeine has a particularly broad, if difficult to predict, effect. It can cause the heart to beat more rapidly, constricts some blood vessels, relaxes others, relaxes airways, and causes some types of muscle cells to contract more rapidly. Quick now! Who was the composer who passionately loved coffee, and whose frenetic fugues most clearly capture the essence of the caffeinated experience? Bach! Valentine’s Day is such an enigma. The emotions of the entire tradition are absolutely based on scientific principles and events, yet scientists, themselves, seem curiously inept at the practice. You would think it would be the other way around. For example, someone in love might say something like, “How do I love thee? Let me count the ways.” Now this counting thing would seem to be right up a scientist's alley. In fact, any good scientist should be able to not only count the ways, but also calculate the mean, standard deviation, and the probability coefficient. At the very least a scientist should be able to do a chi square analysis comparing this love with the love they have for some other person. However, in actuality, scientists seem generally incapable of counting the ways they love someone. In fact, they frequently either ignore Valentine’s Day or completely forget about it. It is difficult to tell the two responses apart, since they appear identical. It also seems that either would be nearly impossible to do considering the massive advertisement campaigns based on the economic interests of the day. That, let alone the elevated expectations accompanying the season. Here is another example. What is so hard about telling a young lady, “O, my luve’s like a red, red rose”? Spelling is often not a scientist’s strong suit, true. But where would Robert Burns be today without the metaphor of an actual, scientific object like a rose? Well, in all fairness, I guess he’d still be dead. But you know what I mean. Who could be better at making a rose metaphor than a good botanist? Even the layman knows that roses are beautiful, smell good, and have nasty thorns. However, a good scientist could also explain that the flowers of most rose varieties, have five petals, and that the number five is the number for a marriage because it is comprised of the female number, two, with the male number three. Instead, scientists tend to go off on the rose being a woody perennial with hundreds of species and thousands of cultivars. They explain that showy flowers are just a ruse to invite pollination and that roses possess sharp thorns as defense mechanisms against being harmed. All of which emphasizes anything but the romantic aspects of roses. It’s like scientists are tone deaf or something. Lord Byron was not a scientist, but a profligate romantic, who coined the lines, “She walked in beauty, like the night of cloudless climes and starry skies.” Now, explain to me why Copernicus, or at least Kepler, didn’t come up with those lines. For crying out loud, were there no fair damsels in those days? It seems such a waste. Astronomers have been studying cloudless skies and starry nights for a long time. I doubt Byron even knew the names of any constellations. He fails to mention even one by name in his entire poem. It seems like there is some kind of flaw in scientists that inhibits their ability to see the essential beauty of their subjects and make application, metaphorically, to emotional matters. My theory is that this inability is not entirely a genetic defect. Admittedly, some people are seemingly born lacking the metaphor gene. But I think long years of indoctrination through the study of science may also play a role. For example, back when I was an English Literature major playing and singing old-English-folk songs in coffee shops, I was far more romantic than I am today after twelve years of higher education. So I call on scientists everywhere to rise up to meet the needs and demands of the modern world. Whatever the question, the answer is "more love".